© Skulpturen står festa i ein solid betongfot på Andaneset, like ved ferjestøa. I know absolutely no Norwegian, and very little about Norway so am at the mercy of what is shown on the websites and Google for translation. The picture caption says "på Andaneset". Wiki describes Anda as "Anden or Anda is a small island in the municipality of Øksnes in Nordland county, Norway. It lies in the Vesterålen archipelago, about 5 kilometres (3.1 mi) north of the village of Stø on the northern tip of the large island of Langøya, and about 14 kilometres (8.7 mi) west of the large island of Andøya." Mapcarta.com says "Andeneset is a point in Møre og Romsdal, Norway, nearby to Juliaberget, Dryparfjellet and Lægda." So why does the article talk of both places? In this case, Wiki leads you astray. There are Anda's many places in Norway. This actual Anda is located to Nordfjord, east of Måløy, the one end of the ferry Lote-Anda connection. On this place, with a great view both east and west, probably one of the nicest viewpoints of Nordfjord, they chose the place to burn their witches. Anyway - next puzzle is yours. Thanks for the clarification and map, Sigve. Wiki missed a chance to bring in its favouurite word - disambiguation with all those Anda's! But I should have guessed that was the answer. Next puzzle. What and where might this be? The people would just be tourists, but they help with scale. Last edited by wherrygirl; November 5th, 2015, 00:40. 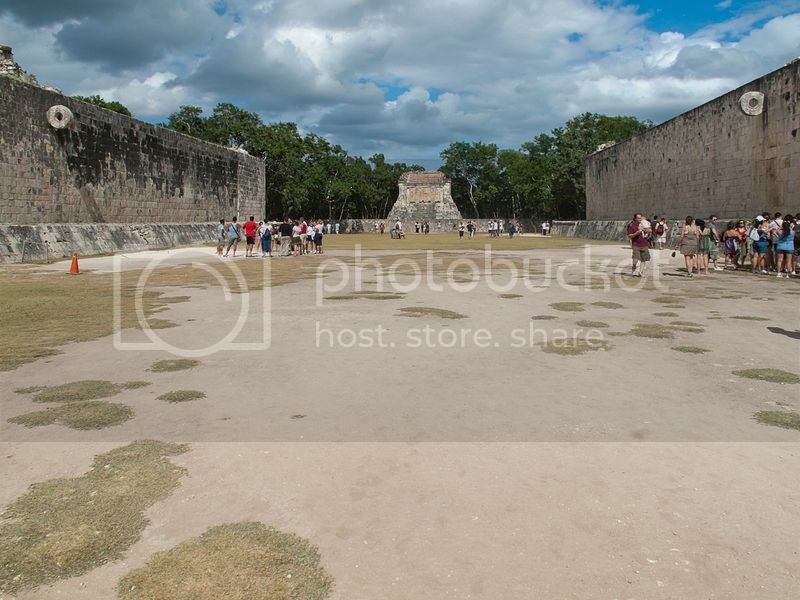 I think his is the great ball court of the Chichen Itza at the mouth of the well of the Itza, a large pre-Columbian city built by the Maya people of the Terminal Classic period. The archaeological site is located in Tinúm Municipality, Yucatán State, Mexico. Sigve! I spent ages searching for something to puzzle you - and you have it already! Well done. Back to you again. Great it is - 166m long by 68m. with walls 12 m. high. 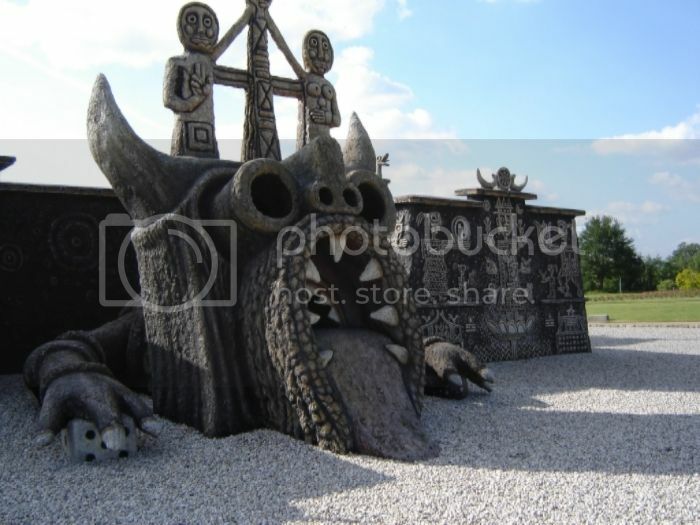 What is this, and where is it? You hit it! 51 minutes! You next! I don't even get to SEE the puzzles before you guys solve them. Well done. A new puzzle to enjoy your day. He doesn't look very friendly. French??? But yes Ombugge this glorius thing is French. There is a Yin Yang mark on the object --- which makes me guess we are in China (to narrow it down a bit). No JO.As suggest Ombugge we are in France....amazingly. This seems to be some kind of representation of multi religious beliefs. Apart from the yin/yang symbol there is the symbolic two-finger and thumb sign of a blessing as used in the Christian church, particularly the Roman Catholic. And is that the Minotaur? Then there is the dice. I'm wondering whether this is some kind of ironic comment on the multiplicity of beliefs in the world and the ensuing troubles. PS, is that a lotus flower on the wall to the right? Is this an entrance to, or within, a sculpture park? Don't think it is ironic since the artist was spiritualist and pantheist.This statue is not the Minotaur but a dragoon which sybolized the guardian (protector) of human knowledges.But this is not a clue I guess. It can help you to know that the French "Art Brut" is called in English:Outsider Art or Outsider Environment. PS: No idea about the flower;it is possible.